It's a new year and everyone (for the most part) is trying to be healthier. 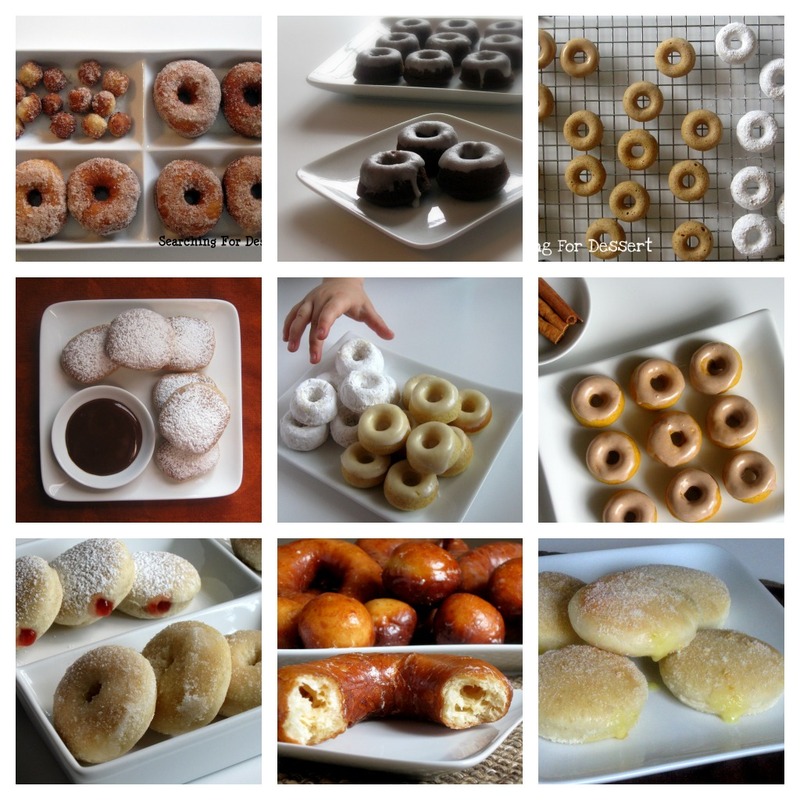 I do love doughnuts though and snacking on a few of these feels indulgent but not overwhelming. They are made with whole wheat flour after all (and a little all-purpose but we won't pay attention to that :) ). Sometimes eating healthier feels like you're missing out on something, or everything. I do love food that is bad for you, a lot. Doughnuts are a food that is usually bad for you, but you can feel somewhat good about eating a few of these at least. I decided on a lemon glaze because I thought the tart would be nice and complementary to the cinnamon-sugar doughnuts I was also making. You could just add a little vanilla and some milk to the powdered sugar also and have a vanilla glaze if you would like too, just a thought. An orange glaze may be nice to, you know I can do this all day but I shouldn't. I think I had all of them baked from start to finish in less than 45 minutes, because they only baked for 6 minutes per batch, which is super quick, but they are super minis. Each of these is about 2" in diameter so if you have a larger doughnut pan obviously you won't end up with 2 1/2 dozen of them and they will bake for longer than 6-8 minutes. I will also say that if you're expecting a fluffy, yeast raised doughnut with these you will be sadly disappointed. 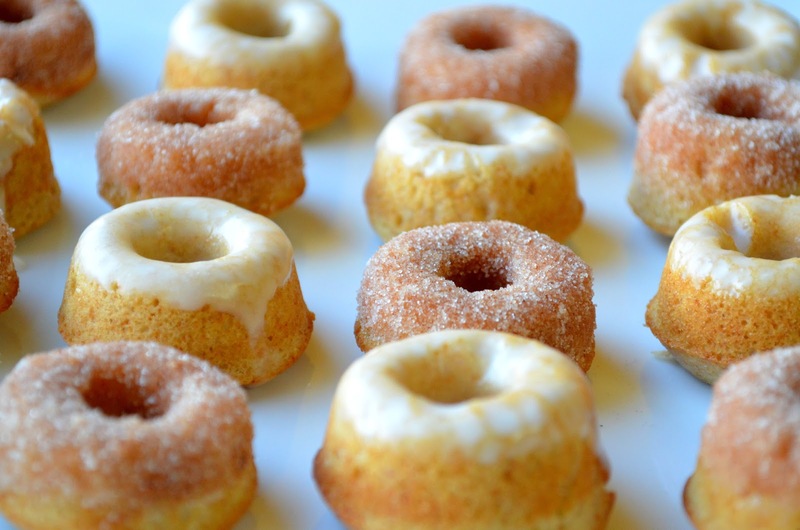 These are a bit more muffin like, more like a cake-like doughnuts, a fluffy cake-like doughnut. I really enjoyed them and I shared them with some friends who also seemed to enjoy them (that's what they told me anyway :) ). My son was eating them without any glaze on them at all and he loved them. He's the type of kid who generally doesn't like glazes on desserts or sauces on food so plain doughnuts didn't surprise me at all. I hope you enjoy them as much as we did! Happy Baking! 1. Preheat oven to 400F. Grease a doughnut pan lightly with nonstick cooking spray. 2. In a medium bowl using a whisk, combine the flours, sugar, baking powder, and salt. 3. Add the milk and next four ingredients to the flour mixture and whisk until just blended together. 4. Evenly portion the batter into the doughnut pan (about ½ full worked really well for me). 5. 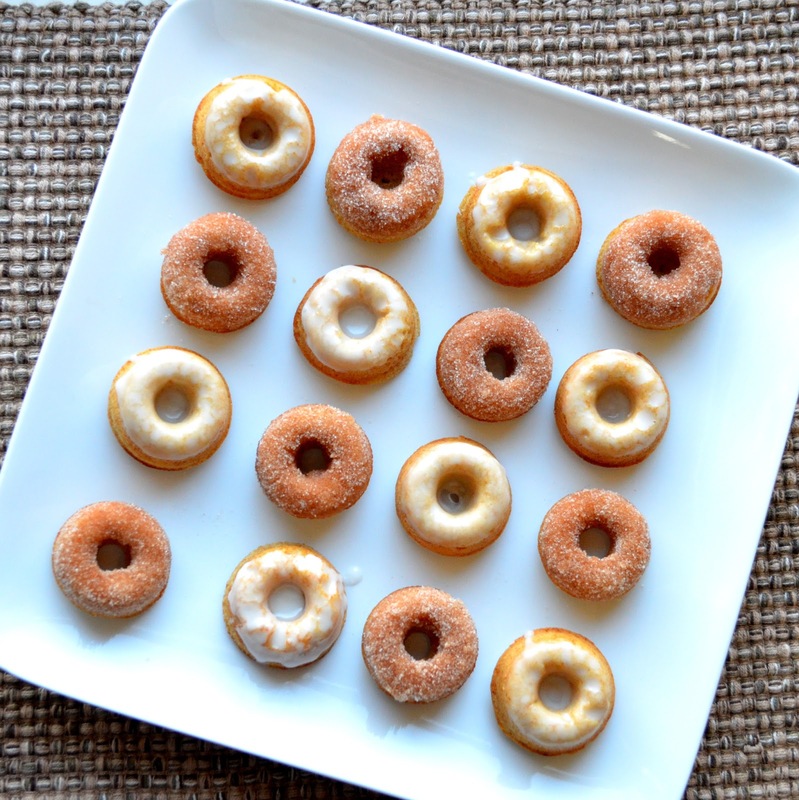 Bake the doughnuts for 6-8 minutes until golden brown and a toothpick inserted in the doughnuts comes out clean. Cool on a wire rack. 6. In a small bowl whisk together the powdered sugar, lemon juice, and lemon zest (if using) until evenly blended. 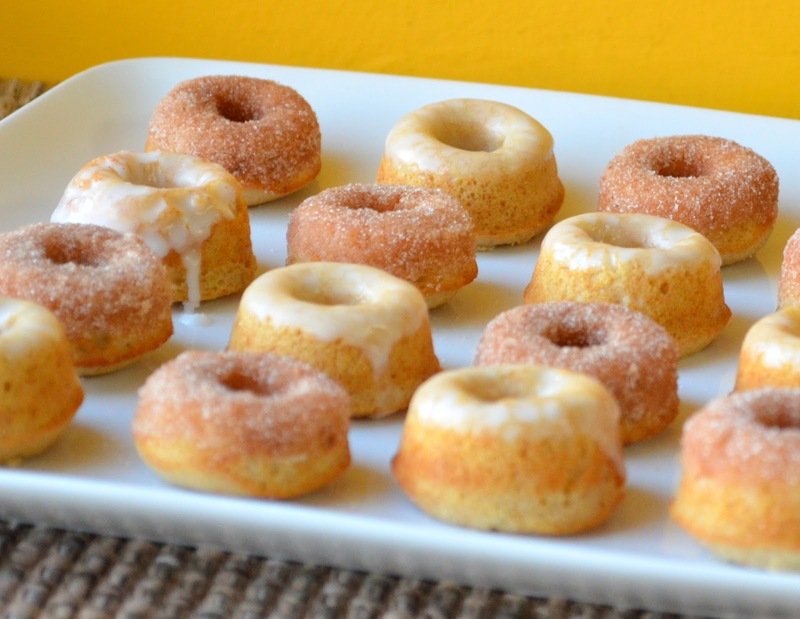 Dip half of the doughnuts in the lemon glaze. Let setup on a wire rack. 7. In a small bowl stir together the granulated sugar and cinnamon until blended. 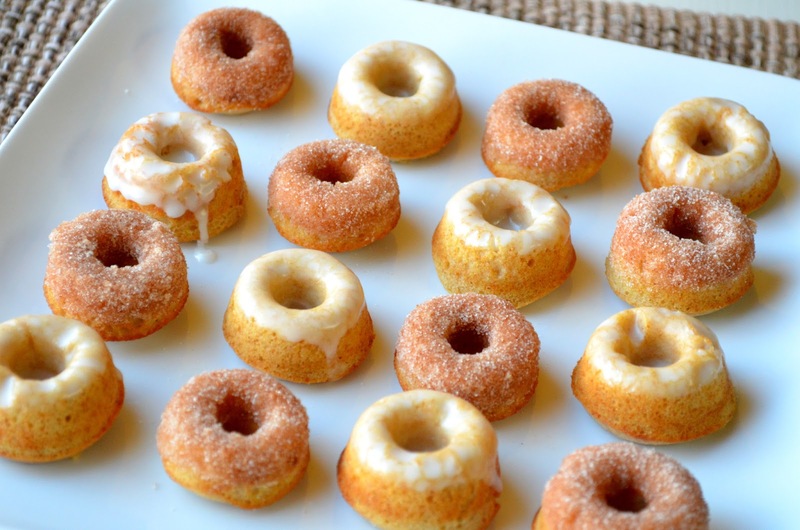 Dip the remaining half of the doughnuts in the melted butter then in the cinnamon-sugar mixture. I dipped mine in the cinnamon-sugar mixture then let it set up a little, then re-dipped it in the cinnamon-sugar mixture again to make sure it was coated well. · Real Housemoms - Fabulous Fridays!